Which dehydrator should I get? Lots of folks ask me which dehydrator I would recommend. I have a 30 year old, 10 tray, Berron Dehydrator, made in BC, Canada by an older gentleman back in the 1980s. Mr. Joybilee has repaired it 3 times with minor repairs, over the years. It’s a workhorse that dries 20 lbs of fruits or vegetables at a time. It is no longer being made. Mr. Berron was past retirement when we met him in the ‘90s. If you ever find one of these at a garage sale – snap it up. I bought mine new at a health food store for $200 – that’s less than $1 per year of use. It was worth every penny! Today, I’d buy an Excalibur 10 tray model. Ok, that one was the Rolls Royce of Dehydrators. I’d actually probably settle for this one. My girlfriend let me give hers a trial run, for two weeks, while we were waiting for a new thermostat for my Berron. I loved it. I was secretly hoping that my Berron was beyond repair. (Don’t tell.) It is quieter than my Berron. It is a tiny bit more efficient. It uses less electricity. It has a smaller foot print. And it is lighter weight. The trays are a little smaller on the Excalibur, but you probably wouldn’t notice the difference. My Berron is so heavy – that it has its own designated cabinet, where it lives, plugged in, year round, even when it’s not in use. The Excalibur is light enough that you can put it away when not in use, and easily bring it out during harvest season. 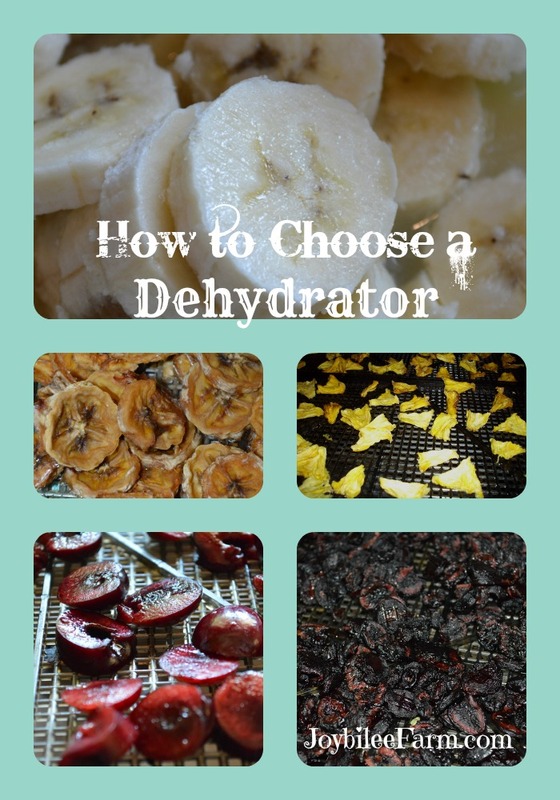 When do you need a dehydrator? Save your pennies and get a dehydrator if you have a garden or you have access to fruit by the box, or you have fruit trees or berry bushes in your neighborhood. Both fruits and vegetables can be dehydrated. 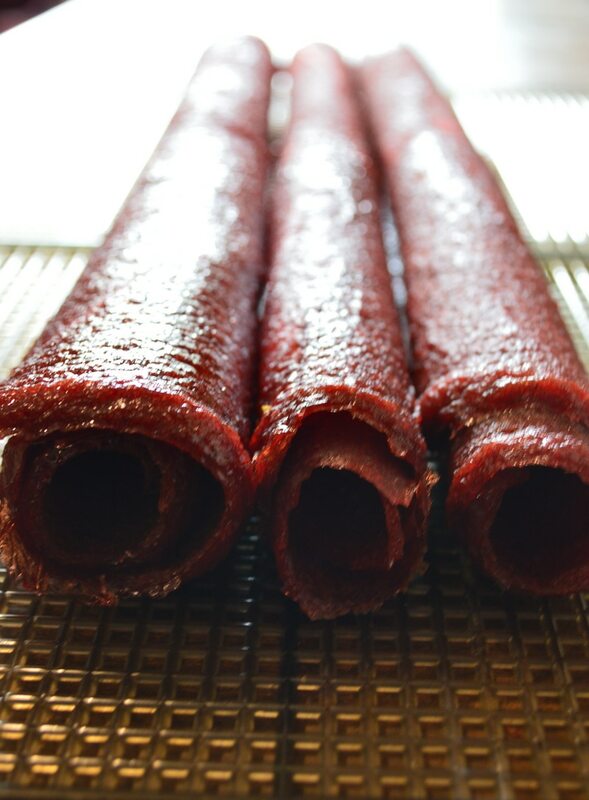 You can also use your dehydrator to make fruit leather, jerky, and dried herbs. It’s a very versatile piece of kitchen equipment, which will serve you for decades. Inadequately dried food can make you sick. 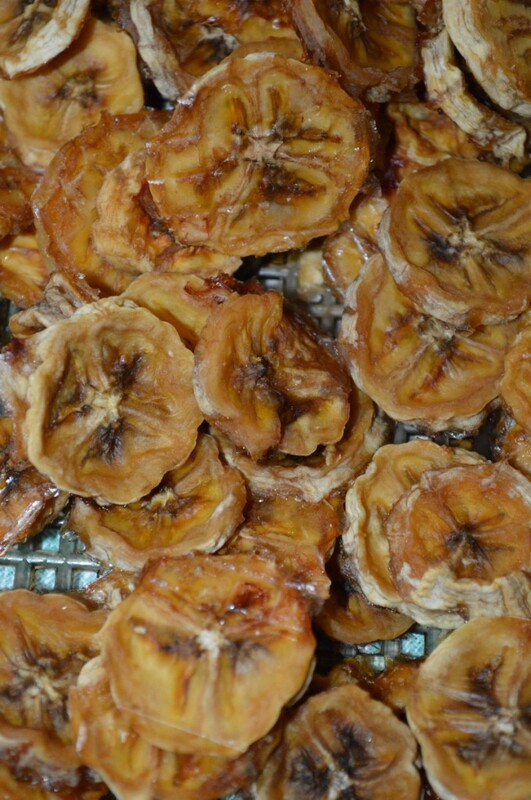 Fruit that is inadequately dried will mold. Throw it out if you notice any signs of spoilage – mold, off smell, slime in the jars, etc. 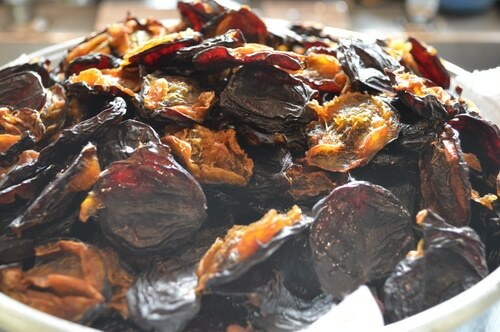 When drying vegetables, meat, and herbs the food should be hard and brittle. You shouldn’t able to bend it. It should shatter on impact. If not, dry a bit longer. Fruit should be completely dry to the touch. When you pinch it between thumb and fore finger, there should be no give in the fruit, and no juicy centre. At room temperature the fruit will be uniform with no cooler areas. Coolness is a sign that there is still moisture in the fruit or vegetable. Fruit may remain somewhat pliable but will be completely dry. Smaller slices of fruit or vegetables dry faster than larger slices. 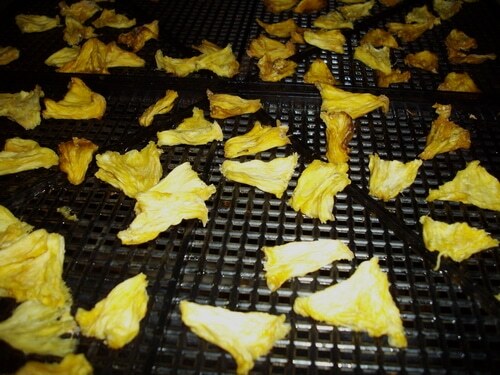 Food that is being dehydrated should be placed on a single layer on the dehydrator trays. Turn food over halfway through the drying time. I like to rotate the dryer trays by placing the upper trays on the bottom and the bottom trays on the top, and turning the front of the trays to the back of the dehydrator for more even drying of the food. After 12 to 24 hours, when most of the food is dried, I consolidate the food onto 2 or 3 trays and place them at the bottom of the dehydrator, in order to allow them to complete their drying process. Then I refill the now empty trays with fresh fruits or veggies, to start a new batch. Don’t dry strong smelling foods like bananas, garlic, or onions with mild tasting food as the dehydrator will transfer flavours between foods. Same with highly spicy foods, like hot peppers, they will make milder foods on lower trays spicy. When storing dried food place stronger smelling foods like garlic, bananas, or peppers in glass jars with tight fitting lids to keep flavours from transferring between foods. Store dried food in a glass jars in a cool, dry place. Protect from rodents and insects. If you choose instead to package in plastic Ziploc bags, place the bags inside a metal can or a plastic bin with a tight fitting lid. Don’t package strong smelling dried food in plastic as the strong smells will permeate the bags. 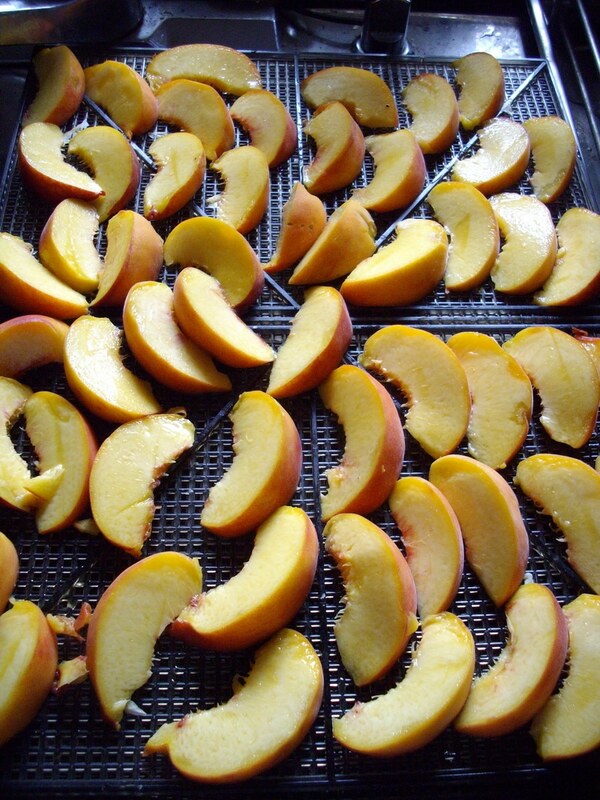 To prepare fruit for drying, simple remove the pit or core and cut into thin slices. Small fruit like cherries or apricots can be cut in half. Light coloured fruit that tends to oxidize easily, like bananas or pears can be dipped in lemon juice before drying, to preserve their lighter colour. I find that the heat from the dehydrator seals the surface of the fruit well, so no pre-treatment is necessary for most fruits. Commercial fruit is fumigated with sulfur compounds during the drying process. Home dryers can omit this potentially toxic treatment with good conscience. Most vegetables should be blanched in steam or boiling before drying to stifle the ripening enzymes in the food. Herbs should be dried on the lowest heat setting to preserve the volatile oils in the herbs. Homemade jerky is amazing. Marinate tougher cuts of meat in over-proofed, vinegary tasting kombucha, add herbs and garlic to the marinade. Let it sit in the fridge overnight, soaking up the juice. This tenderizes your meat and removes any excess blood from the muscle. Drain it and dehydrate until brittle. Sensational and healthier than store bought jerky, especially if you are raising your own grass fed meat. You can also use your dehydrator to proof bread dough, or to incubate yoghurt or cheese. Remove the trays and use the low heat setting. This is the model I recommend. Thanks for all the great how to information. You have given me new ideas on foods to dehydrate. I love the Excalibur dehydrator as well! Hello all you Berron Fans. I am the Ber of the Berron. The dehydrators were made in the 80″s and my husband then was Ron Neff and I am Bernice Neff and together we produced three sizes of dehydrators amongst other Back to Basics do it yourself items. I myself looking for a good food dehydrator the is CSA Approved. If any of you have any tips please let me know. Hi, Bernice, thanks for your comment. I’m still using my Berron regularly. We’ve had only one repair in 30 years. When I replace it I’ll be going with an Excalibur. I bought a used Berron last summer, and I’m wondering if you have any tips to prevent fruit from sticking to the trays. Maybe I’m slicing too thin, but I’ve had some pieces stick to the point that they couldn’t be salvaged. I started using thin flexible cooking sheets so it’s easier to peel off, but it seems to drastically increase the drying time. I’d appreciate any tips from your experience with this brand! Yes, I also have some trouble with very juicy fruit sticking to the dryer trays. Try oiling the sheets with a thin coating of butter or spray with nonstick cooking spray (I don’t use this). Generally if you can peel off the fruit and turn it over part way through the drying time, it won’t stick, when its finished. Lucky you to find a used Berron. The very best thing about them is they are simple enough to repair at home since they have no computerized parts. Thank you for your informative article! I have a Berron dehydrator that also needs a repair. What kind of place would I be able to bring it for service? Do you know where I would be able to order a replacement thermostat? Thank you for your help. Check with your local electrical service place. Ours put us in touch with a parts supplier and we were able to have the part we needed shipped to us. Can you still find trays to fit the Berrons? Mine got warped when the got to close to a fire. I’d love to have another Excaliber! I had the biggest one they made 31 years ago, and it died after 22 years. It got a LOT of use! That’s a great track record. I’m glad to hear of your experience, Catherine.